A company at the Port of Miami has sued to block the takeover of shipping operations there by a state-owned business in the United Arab Emirates. It is the first American courtroom effort to capsize a $6.8 billion sale already embroiled in a national debate over security risks at six major U.S. ports affected by the deal. The Miami company, a subsidiary of Eller & Company Inc., presently is a business partner with London-based Peninsular and Oriental Steam Navigation Co., which Dubai Ports World purchased last week. In a lawsuit in Florida circuit court, the Miami subsidiary said that under the sale it will become an "involuntary partner" with Dubai's government and it may seek more than $10 million in damages. The Miami subsidiary, Continental Stevedoring & Terminals Inc., said the sale to Dubai was prohibited under its partnership agreement with the British firm and "may endanger the national security of the United States." It asked a judge to block the takeover and said it does not believe the company, Florida or the U.S. government can ensure Dubai Ports World's compliance with American security rules. A spokesman for Peninsular and Oriental indicated the company had not yet seen the lawsuit and declined to comment immediately. The lawsuit represents the earliest skirmish over lucrative contracts among the six major American ports where Peninsular and Oriental runs major commercial operations: New York, New Jersey, Baltimore, New Orleans, Miami and Philadelphia. The lawsuit was filed moments before the court closed Friday and disclosed late Saturday by people working on the case. The sale, already approved by the Bush administration, has drawn escalating criticism by lawmakers in Washington who maintain the United Arab Emirates is not consistent in its support of U.S. terrorism-fighting efforts. At least one Senate oversight hearing is planned for later this month. The Port of Miami is among the nation's busiest. It is a hub for the nation's cruise ships, which carry more than 6 million passengers a year, and the seaport services more than 30 ocean carriers, which delivered more than 1 million cargo containers there last year. A New Jersey lawmaker said Saturday he intends to require U.S. port security officials be American citizens, to prevent overseas companies operating domestic shipping facilities from hiring foreigners in such sensitive positions. Republican Frank A. LoBiondo, chairman of the Coast Guard and Maritime Transportation Subcommittee, cited "significant" security worries over the sale to Dubai Ports World. Caught by surprise over the breadth of concerns expressed in the United States, Dubai is cautiously organizing its response. The company quietly dispatched advisers to reassure port officials along the East Coast, and its chief operating officer, internationally respected American shipping executive Edward "Ted" H. Bilkey, is expected to travel to Washington this week for meetings on Capitol Hill and elsewhere. The Bush administration in recent days has defended its approval of the sale, and has resisted demands by Congress to reconsider. State Department spokesman Sean McCormack described the United Arab Emirates on Friday as a "long-standing friend and ally" and said the United States and UAE had a good relationship. President Bush visited the seaport in Tampa, Fla., but did not mention the dispute Friday. The president said an important element of defeating terrorism was taking precautions domestically and working with local government officials. "We've got to protect ourselves by doing smart things in America," Mr. Bush said. "I appreciate working with the mayors on homeland security issues." CBS News reports that Baltimore Mayor O'Malley, who co-chairs the U.S. Conference of Mayors' Task Force on Homeland Security, is calling on President Bush to reverse the decision. O'Malley on Saturday harshly criticized the president's approval of the ports deal as an "outrageous, reckless and irresponsible decision" and urged the White House to reconsider the sale. Baltimore is one of the affected ports. O'Malley also is running for the Democratic gubernatorial nomination in Maryland. Dubai Ports World declined through a spokesman to respond to O'Malley's remarks. In New York, families of some victims from the September 2001 terror attacks planned to criticize the deal during a press conference Sunday with Democratic Sen. Charles Schumer, a leading critic of the sale. 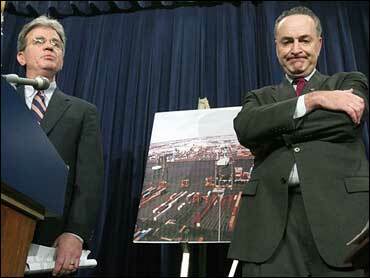 Schumer said he is dubious any assurances can justify involvement by the United Arab Emirates in American ports. Schumer and other critics have cited the UAE's history as an operational and financial base for the hijackers who carried out the attacks against New York and Washington. "A lot of families are incensed by this, because you're talking about the safety of the country," said William Doyle, whose son Joseph died at the World Trade Center. "We have a problem already in our ports because all of our containers aren't checked, but now they want to add this unknown? It's not right." LoBiondo's legislative proposal would amend federal maritime laws to require facility security officers, which operate at terminals in every U.S. port, to be American citizens. LoBiondo said there are presently no citizenship requirements, which he said permits foreign companies who are or become partners in domestic terminal operations to employ security officers who are not Americans. "We cannot be lax about our nation's security nor fail to recognize that our ports are realistic targets of terrorists," LoBiondo said.